This fabulous “trip of a lifetime” with Penn Alumni Travel really lived up to its billing, and its two parts were like completely new chapters, each totally absorbing and totally different from the other. Our journey began in Lima, where our local Odysseys host showed us the colonial square and the adjoining narrow streets with their charming wooden balconies. She also gave us an hour-long introduction to pre-Spanish art and culture in the private museum, Larco Herrera, which spanned the entirety of native cultures from ten centuries BCE to the 1532 Spanish conquest. Among treasures that we saw there were fabulous weavings from the Paracas culture of the south coast of Peru and stunning portrait vases from the later Moche culture of the north coast. 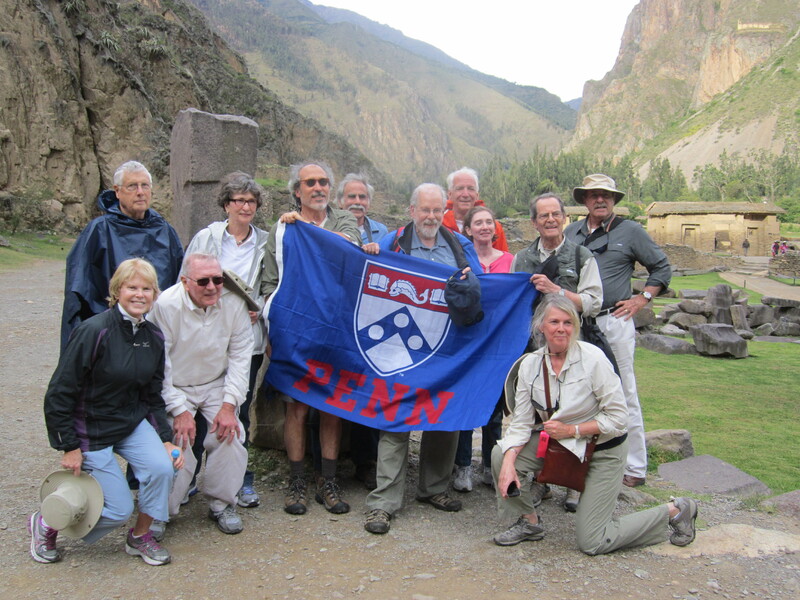 Larry Silver with alumni travelers in Peru. Soon we were winging our way to the highlands of the Incas, passing through Cuzco, their ancient capital, where we stopped to see the Koricancha, Temple of the Sun, before passing over high mountain passes into the Sacred Valley, watered by the river Urubamba. 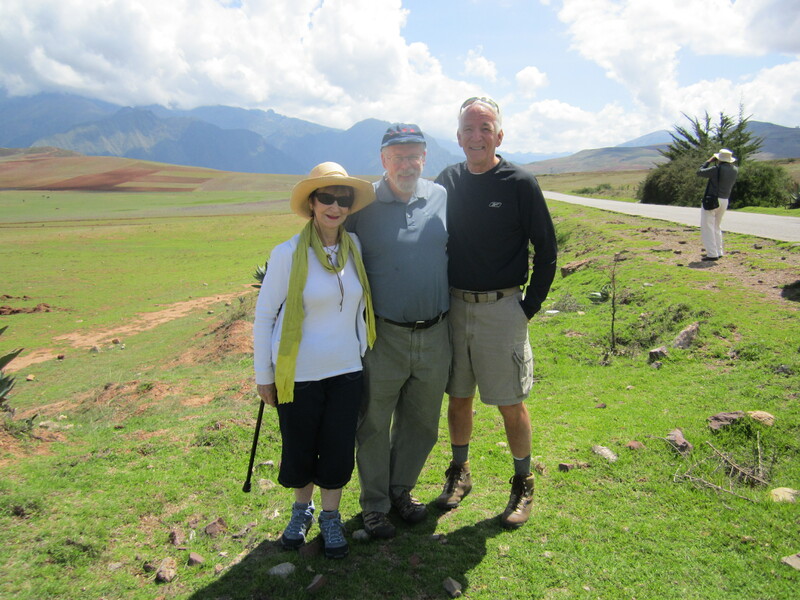 Our next several days were spent in excursions all around the Sacred Valley, punctuated by views of sacred sites on the high plains (altiplano). One highlight featured a morning with native weavers in Conchierro, who showed us not only their techniques but also the natural plants from which they made their dyes. Some of us took home their exquisite traditional weavings. In addition, one of the evenings in our Sacred Valley hotel featured (appropriately) a local shaman, whose blessings for the group in his native Quechua were translated by our regional guide and concluded with a ritual fire of the magical elements he had used in his incantations. We had mixed reactions to the ceremony, but certainly whatever he invoked worked for the remainder of the trip, for we had remarkably trouble-free travels. 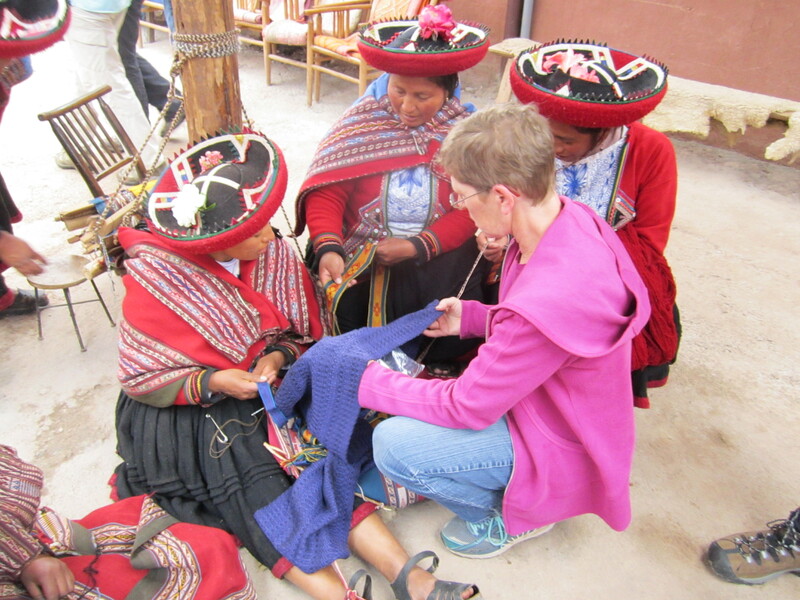 Traveling in the Sacred Valley. From Olaytatambo, a fortress town that resisted Spanish conquest (some of us hiked up to the peak of the citadel with its characteristic large, fitted Inca stone), we took one of the world’s great train rides down to Machu Picchu (still at over 8000 feet), but we noticed the greater tropical flora and birds as we descended. 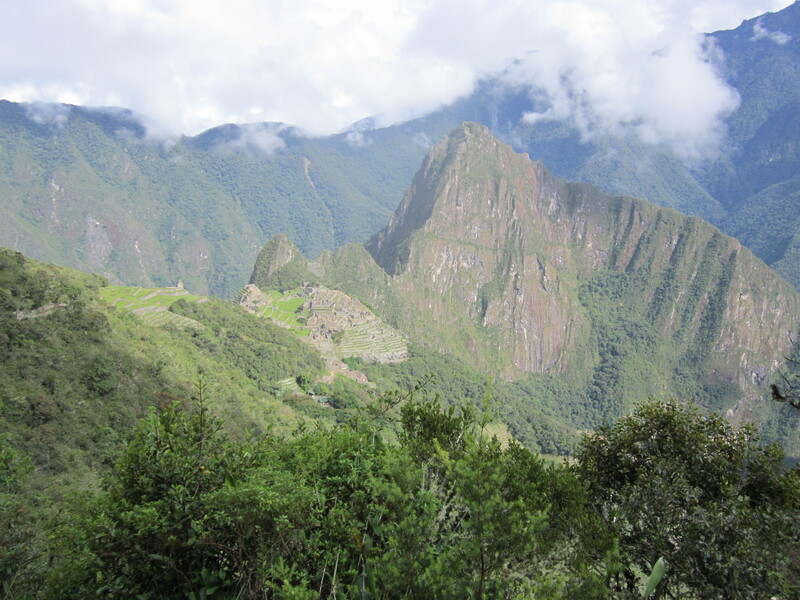 Then came the climax at Machu Picchu, which sits in an overwhelming setting high above an oxbow bend of the River Urubamba on a saddle setting between two towering mountain peaks. We there had the advantage of our great guide Julian to explain the history of the site as well as to itemize the original functions of the varied buildings, otherwise quite similar in form, except for distinctions in the stonework of their construction. 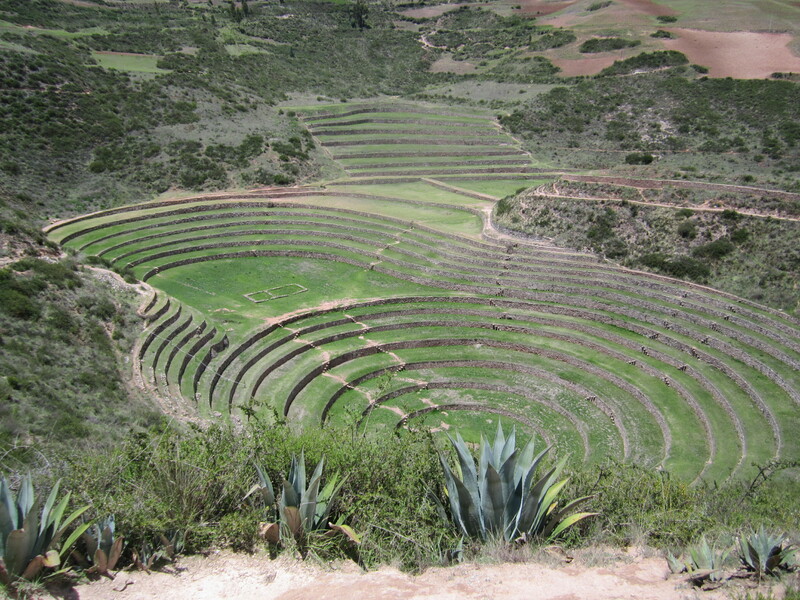 That location, the “Camp David” of the grand Inca Pachakuti in the later 15th century, was probably built in a mere decade but became a major shrine and outpost of the Inca even after the Spanish conquest; it was only rediscovered a century ago when an adventurer from Yale followed farmers’ tips and uncovered the place from its overgrowth. Our two-day stay there took us over almost all of the remaining struc- tures, and we had the great advantage of a fabulous hotel location, just steps from the entrance gate, so some folks took good advantage of the early morning opening for extra activity with smaller crowds. 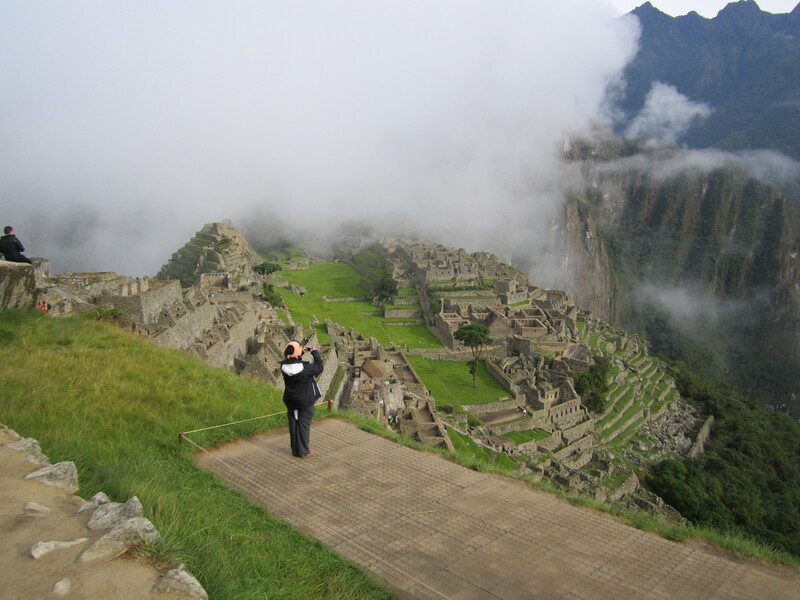 Some of us sat and contemplated the setting from above the ruins, while others hiked up to the segment where the Inca Trail descends finally to Machu Picchu itself. Stunning views everywhere—and what was different from even the finest photos of the site is how its mountain peaks and gorges simply envelop the visitor in a breathtaking 3-D way no image can capture. Penn alumni and friends stop for a photo-op. Our marvelous afternoon train ride all the way back to Cuzco included a fashion show, distracting to some but a shopping bonanza for others. Cuzco itself is a splendid city, and our morning tour included visits to a few of the richly decorated main churches (the Spanish put in far too many churches for any short visit; they were determined to Christianize the Inca pagans, just as they built their Dominican church atop the splendid foundations of the Koricancha Sun Temple). 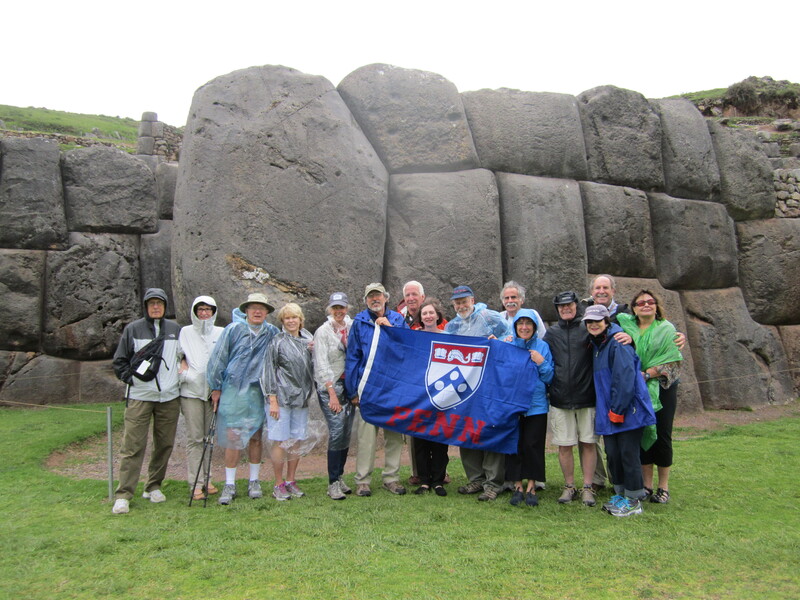 One of our rare bouts of wind and rain dampened the visit to the great citadel Sacsahuaman above the city, though it afforded yet another chance for a group photo and a sight of some of the most massive building stones this side of the pyramids of Egypt. No wonder the Spanish dismantled all the building blocks that they could move; these were the inextinguishable markers of Inca engineering and power. The group stops for another picture in front of the massive building stones. For some, the local host lunches that followed were another way to make real contact with the Peruvians, not to mention their most distinctive local dish, guinea pig. Our Cuzco hotel, the Monasterio, was a fabulous base for free exploration of the city; its authentic colonial paintings in the main chapel and throughout the building provided a further opportunity for immersion in the religious life of the Spanish city. Almost all of us found memorable dining experiences on our own in the evening. Logistics of leaving Peru for Ecuador occupied most of the next day, further complicated by the fact that the lovely, but largely empty, new airport of Quito has not yet been complemented by a proper roadway to get there. We got to cross a deep gorge over a “temporary” bridge built for the oil industry, which is a major export of Ecuador out of its Amazonian basin. Eventually, after a night in Quito, we flew to the Galapagos and met our lively naturalist Rial, plus the enigmatically named and hunky Victor Hugo. They were our constant companions on and off the Coral I, a boat whose food was tasty, whose crew was experienced and friendly, and whose steadiness on the open ocean waters was a comforting way to visit the islands. We grew pretty fond of the men who piloted our dinghy and the informed guides who found the full range of animals and then explained their ways to us. What an amazing set of islands! Stark, whether dry scrub or lava-covered, they hosted all of those amazing creatures we had come to see—and we were not disappointed. Penguins not only leaped in clusters after schools of fish as we made our way along the coast in the rafts, but one of them entertained us at the stern one morning as he breakfasted among a cluster of sardines swimming in circles. 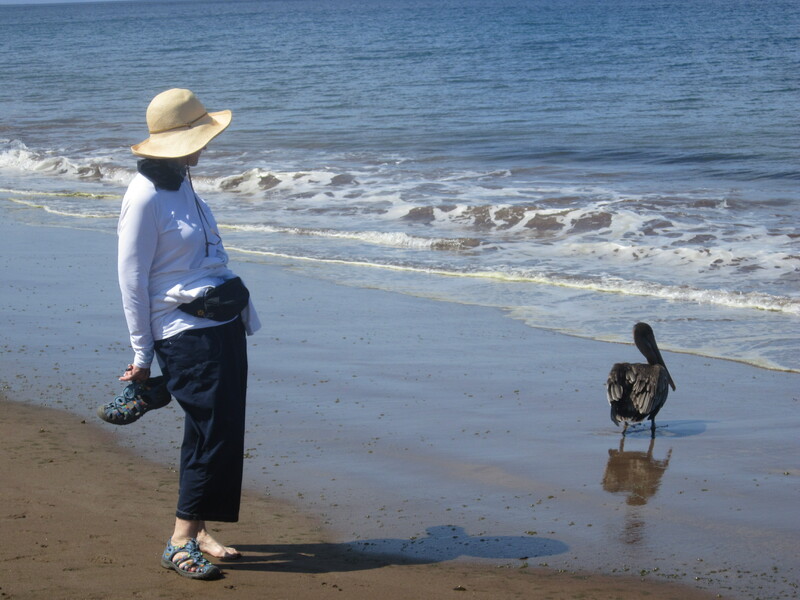 Some of us even saw penguins while snorkeling, one of the great delights of the Galapagos sojourn. 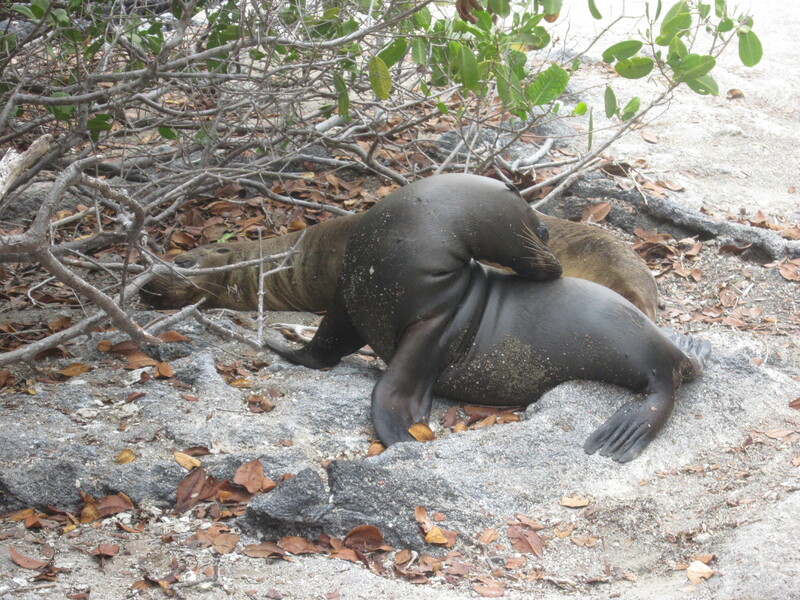 Sea lions of several species were everywhere, on shore and in the water, also sometimes on view while snorkeling. Pelicans might have been familiar, but to see them and the unfamiliar, rare blue-footed Boobies crash diving into the surf was an unforgettable spectacle. We had a rare, calm view of a Galapagos Hawk in a tree, as well as other unfamiliar creatures, such as the Oyster-Catcher on her nest. And who can forget the Frigate Birds, hovering like pterodactyls above the boat or following its wake, gliding gracefully above us. 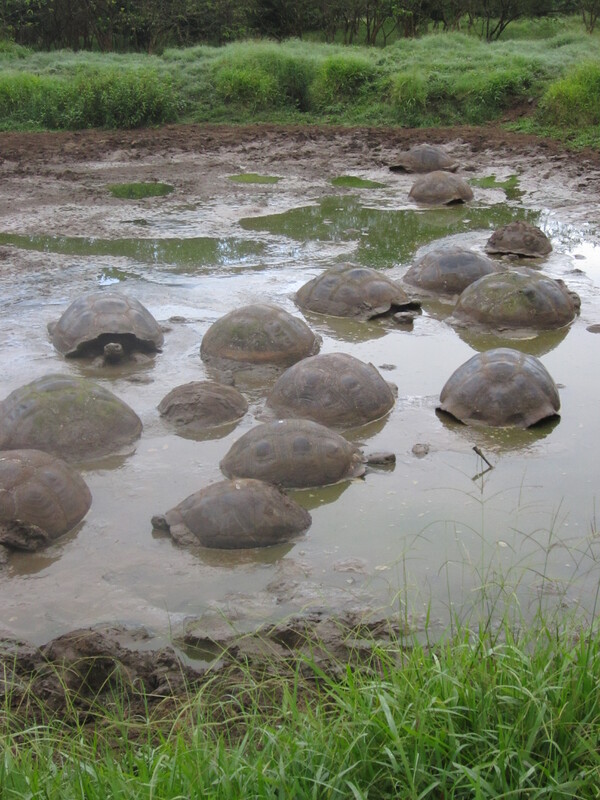 Of course, the signature creatures of the Galapagos remains the giant Tortoise, and we saw slightly different versions on every island, not least at the Santa Cruz sanctuary on the last day, when a mudbath occupied as many as a dozen of the animals. They were perhaps the only really shy animals we saw, pulling in and hissing when we had to share the same trail, but for the most part these placid reptiles relaxed and set a great example for travel mellowness. No one who saw them, especially on Fernandina’s lava flows, will forget the Marine Iguana colony, and then later on Isabel (one of three different stops on that large island) we finally saw the yellow Land Iguana. It was like a Jules Verne dinosaur movie to move amidst those creatures, seemingly without their having a care for us as threats—though their spit-like ejections of salt were anything but welcoming. Even the major recent flows of lava, broken only occasionally by the intrusion of lava cactus, were a sight—really without comparison except at a few other places, such as the Big Island of Hawaii, were a spectacle to remember. Victor Hugo gave a great talk on the boat about tectonic plates that move across the earth and about hot spots, such as the Galapagos or Hawaii, where the newest islands are on one end of the archipelago and the older, smaller, more verdant islands have drifted away, though still showing their calderas or their shield volcanoes. 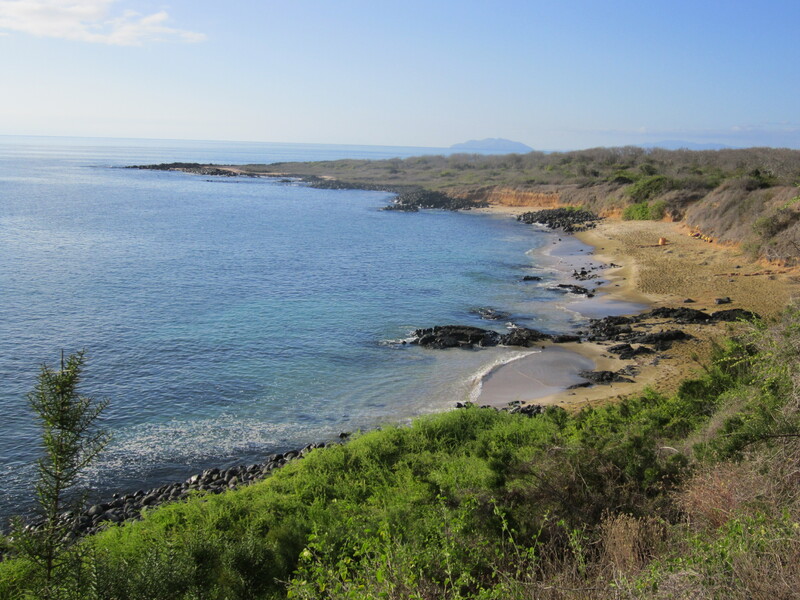 We really got a great geology lesson in the Galapagos to complement our archaeology from Peru! 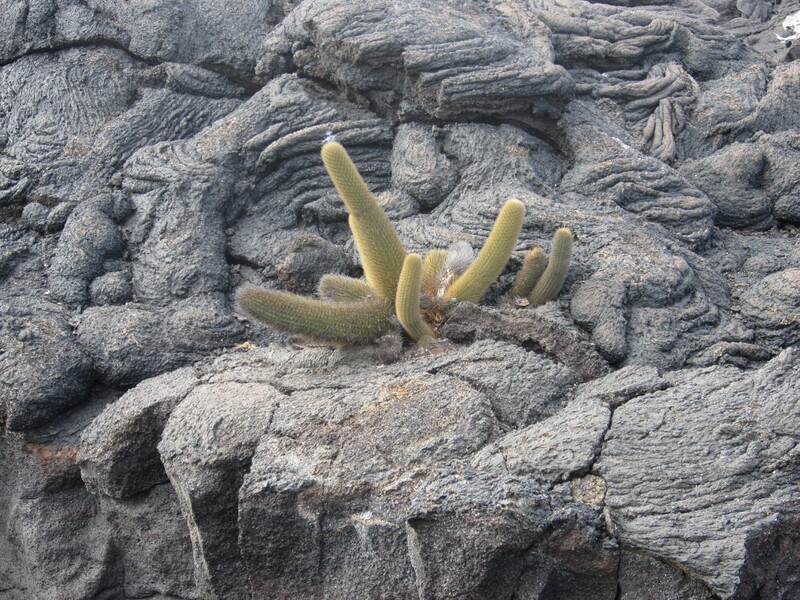 Plant life in the lava flows. A final flight back to Quito resulted in a last-day tour of that capital. We had a great morning, over-brief between sights and shopping, in the colonial city, whose gilded Jesuit church was a climax of opulent conversion technique, and we enjoyed the main square with its Franciscan church surrounded by jewelry, panama hats, local chocolate, and other goodies. The morning ended with a most memorable view of the Ecuadorian President and the changing of the guard. Afternoon outside the city showed a bit more of the volcanic uplands, not to mention a blustery final group shot straddling the Equator (plus a bi-hemispheric smooch photo). And then LOTS of airport stays as we dispersed to our respective homes, armed with slides, new friends, and lots of memories. 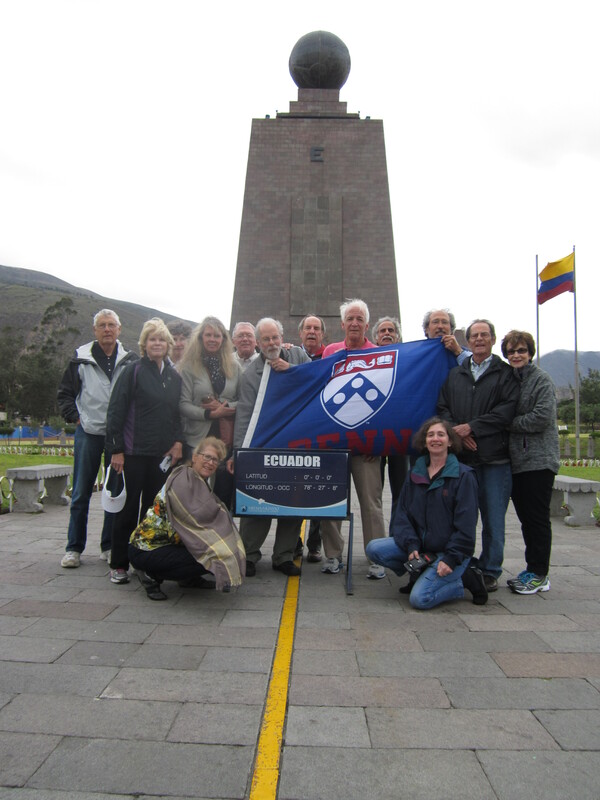 Penn alumni and friends at the equator. This was an amazing combination of sights and sites, of archaeology and geology, not to mention zoology. Odysseys took good care of us throughout, so that almost everything ran on time and without any cares on our part. Their itinerary was diverse and well-planned. Thanks to all who participated—good sports and hardy travelers who tried everything from climbing ancient steps to snorkeling in unglamorous wetsuits. Penn can be proud of such a diverse and interesting, not to mention congenial, group of alumni (and groupies in some cases). I hope that our paths will cross again soon, whether on another trip (with Penn Alumni Travel) or with continued personal contact. Happy holidays to all—let’s share those great photos and email messages in the meantime and stay in touch! Larry, You’ve captured our adventures in such an interesting and informative way! It brings back a flood of memories that I shall treasure for a lifetime. Thank you for sharing it with us.